Our professionally guided Thailand motorcycle tours commence in the beautiful city of Chiang Mai and include famous Mae Hong Son loop, an adventure tour through the mysterious Golden Triangle & the Thailand motorcycling tour also passes through the perfectly formed road curves of Nan region (our favorite Thai road motorcycling area). 6 days - USD$ 1,695 (all inclusive) (sealed/ tarmac road). The historic opium drug route, one of the most fascinating regions of South East Asia. We've kept this tour under 1 week, as so many people don't have a lot of time, but we've managed to keep all the top spots in the tour, an all round winner. The perfect Thailand motorcycle tour (Golden Triangle) starting from Chiang Mai. It was actually the U.S State department that first adopted the name "The Golden Triangle" for the region due to the concentration of opium growing in the area.The confluence of the Ruak River & Mekong River make the geographical point of the Golden Triangle where the 3 borders meet. There's a great historic element to this Thailand motorcycle tour where you will be able to experience the transition the ethnic local tribes had to make as they income vanished from opium farming and the shift they were forced to make into tea and coffee production to survive. Thailand still has about 70 ethnic tribal groups, the hill tribe ethnic groups (Hmong, Akha, Lisu & Tai Yai) where our Thailand motorcycle tour takes place, make up only about 1% of Thailand's population. Click this link to see more on our Facebook page . Click here to see what motorcycles we use. We design custom motorcycle trips for your free time. If you are looking for custom motorcycle tours in Thailand, we can easily arrange this. We can design custom motorcycling adventure trips incorporating Phuket, Bangkok, Kanchanaburi, Pattaya & Chiang Mai very easily. 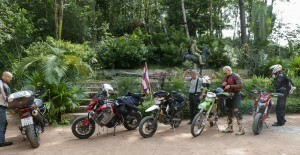 Another option which has become popular is the Thailand camping motorcycle tour. We have surveyed all the best camping locations to incorporate in a fully inclusive Thailand camping motorcycling trip, with support vehicle to carry the rider’s camping gear & trained chefs to offer gourmet food while on the camping tour, it’s an interesting option. Check them out - Camping motorcycle tour info CLICK HERE. Our Thailand off road motorcycling tours offer “the best” of Thailand’s adventure dirt road tour you could possibly have. Check them out - Offroad tour info CLICK HERE. 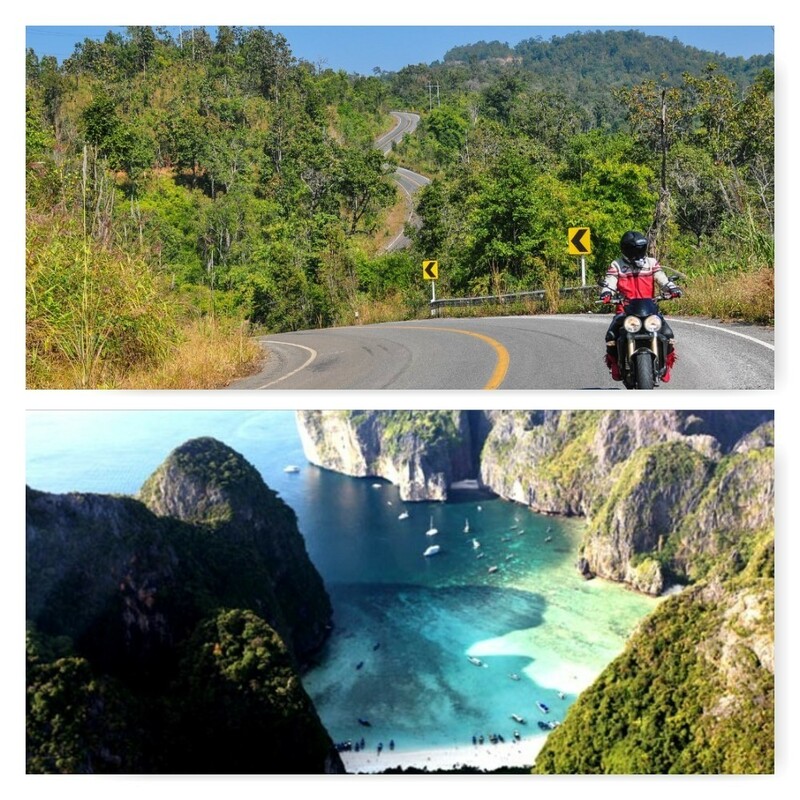 Also take a look at our new combined 5 day north Thailand motorcycle/ 5 day Phuket catamaran tour offering (11 days total) Thailand Motorbike & catamaran tour package info CLICK HERE. Some say the roads to Nan are the best in Thailand, they could be right. This is a beautiful ride eastwards through the mountains of Thailand with lots of ridge line viewpoints. Once in Nan, we will visit Wat Pumin (Nan’s famous Buddhist Temple) with its historic murals. An amazing riding day. We live here and ride here, this is where we aim for when we ride! The roads here are almost like a race track. No cars just hundreds of beautiful curves and great road surface. The town of Chiang Khong is situated on the Mekong River & is the border down crossing into Laos. A perfect setting after a bindblowing days ride. 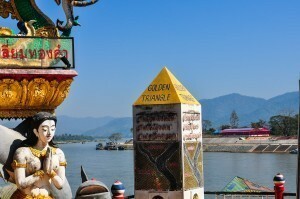 Today we will be in the Golden Triangle, where Thailand, Myanmar & Laos all meet. We’ll also be in the region of the old opium trade route. We will visit the old drug lords house who at one time offered his whole opium crop to the Australian Government for USD$ 50 million. They refused of course. Replacing the opium poppy fields, we’ll see tea plantations in their place. Our destination for the day, Doi Mae Salong has immense history with the Chinese KMT army which were forced to retreat here 70 years ago, in fact most of the village still speak Chinese. A beautiful ride down the mountains and south to pick up the Mae Hong Song Loop road with its 1,864 beautiful curves. Our destination, Pai, has become a buzzing lively town with all year round activity. Heading west from Pai, we’ll have lunch in Mae Hong Song & then ride some more great twisty roads south to Mae Sariang, a traditional “Karen Tribe”/ Myanmar town on the Myanmar border. Our Last day and an easy sweeping ride along the Mae Chaem River. We will visit some amazing waterfalls before we head back to Chiang Mai. A video which shows some of the fantastic roads on one of our north Thailand motorcycle tours.